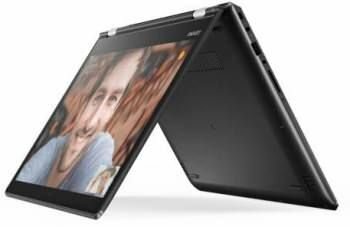 The price for Lenovo Yoga 510 Core i3 6th Gen - (4 GB/1 TB HDD/Windows 10 Home) Yoga 510 2 in 1 Laptop ( 14 inch Black 1.73 kg ) is valid across Bangalore, Hyderabad, Chennai, Mumbai, Delhi, Pune and Kolkata. The Lenovo Yoga 510 Core i3 6th Gen - (4 GB/1 TB HDD/Windows 10 Home) Yoga 510 2 in 1 Laptop ( 14 inch Black 1.73 kg ) is available at best price of INR 38999 on Amazon. Have used this lappy for couple of days now Pros:- 1.Pretty Slim hence light weight. 2.Matte black color looks premium. 3.Touchscreen response is pretty good. 4. 14 inch screen size is ok, although for a 2 in 1 laptop 13.3 inch screen size or below would have been better 5.Battery Backup is impressive 6.The adapter is also light and it supports fast charging. 7.Windows 10 works like charm, no lagging as of now(havent done any gaming though) Cons: 1.The keypad is just about ok for me not quite impressive. This is not a huge problem, so overall quite a good Laptop considering the price at which its available. VERY GOOD PRODUCT ONLY THROUGH "" FLIPKART ""
1.This is laptop or tab 2.very good touch screen. 3.Only through Flipkart with exchange 33K. 4.Very easy charge and charger to carry easy 5.Long Battery life. 6.Don't think buy from Flipkart. 7.I claim back to school offer also. Got it for 33k (with exchange and offer) Pros: Full HD. 4K Videos play very smooth. Cons: Battery runs for 2-3 hours. Could have been better.